Showing 1 to 50 of 57 job(s). A&H Actuary. Our client is a global insurer looking for an experienced accident, health, and specialty actuary to join their growing business unit. This is an excellent opportunity for anyone interested in all aspects of product management, including pricing, reserving, and risk management. Candidates must have 5+ years of relevant product experience and a strong technical skillset in MS Office and scripting languages. Eastern Region. COLI/BOLI Product Lead: FSA or ASA to be responsible for strategic direction and all the pricing for the COLI/BOLI business in the Institutional and Workplace Protection product group. Will be exposed to other product lines too. Northeast Region. Long Term Care Pricing AVP. This insurer is searching for a credentialed actuary to lead the pricing and in-force management of their active LTC block of business. This role will be responsible for rate development and reviewing/preparing state filings, and supporting new business initiatives. Applicants must have 10+ years of relevant experience and skill in an actuarial modeling platform. Southeast Region. ASA, Group Pricing. Seeking an ASA with 2 – 4 years of relevant work experience in the Group Disability, Group Life and AD&D product portfolio space. This intermediate level position requires significant technical expertise and will support the pricing and maintenance of this product line, as well as recommend pricing, valuation and reserving assumptions. Must have strong computer skills including Excel, one programming language and mainframe systems/database utility. Northeast Region. FSA, Financial Solutions. Working closely with product actuaries and other key stakeholders across the organization to develop new financial solutions and reinsurance products for the life, annuity and health markets. 10+ years of relevant experience, including at least 2 years of experience structuring complex financial transactions. Southeast Region. Director of Valuation. This is a great opportunity for an FSA interested in serving as a leader in financial reporting for life and A&H product lines. Candidates for this role can expect to work on GAAP, Statutory and Tax reserves and similar financial analysis and reporting across the enterprise. Four or more years of relevant experience in similar workflows and products are required for success in this position. Southeast Region. A&H Support Actuary. Junior actuary needed to support A&H leader. Will support the insourcing efforts of all A&H actuarial work. Perform valuation, experience studies, assumption setting, rate filings, financial plan and embedded value analysis for Medicare Supplement, LTC, DI and Critical Illness business. Participate in new A&H product development, including pricing support. Great opportunity to join a dynamic and collaborative environment. Must have some A&H experience. Flexible on level. Will offer exam support. Northeast Region. A&H Leader. FSA needed to lead the in-sourcing of all actuarial work related to Medicare Supplement, LTC, DI and Critical Illness business and educate broader actuarial team on A&H business. Will also manage valuation, experience studies, assumption setting, rate filings, projections, financial plan and embedded value work for all A&H businesses as well as support new A&H product development and pricing. This is a dynamic and collaborative environment. Looking for excellent communication skills as well as leadership skills. Ideal candidate will be entrepreneurial and flexible with a changing and evolving workplace. Northeast Region. ASA, Health Actuary. Seeking an actuary to conduct analysis, pricing and risk assessment to estimate financial outcomes. Manage health plan specific actuarial needs and produce actuarial reports to aid in developing corporate strategy. 3+ years of actuarial experience. Southwest Region. Managing Actuary. This client is searching for experienced health actuaries to join their corporate leadership. The role will give candidates opportunities to further develop their health expertise in the interest of growing and developing products and analysis for a major regional insurer. In order to be considered, candidates must have 4+ years of actuarial experience and either an ASA or FSA credential. Applicants with relevant experience and strong technical and programming skills will be preferred. Multiple positions available. Southeast Region. Pre-ASA to FSA, Group Reinsurance Actuary. Seeking someone to provide actuarial support to reinsurance clients in the areas of market consulting, reinsurance pricing assessment and recommendations for optimal reinsurance program structures. This position will primarily support Group Life and Disability lines of business but may also support Medical lines of business as well. Non-traditional role for someone seeking a unique opportunity. Northeast and Eastern Regions. ASA, LTC actuary. Seeking an actuary to work on long term care model development team with primary responsibilities related to maintaining and improving liability and asset actuarial models in GGY AXIS. 3+ years of experience in the actuarial field with exposure to GAAP, Statutory and Tax financial reporting. Southeast Region. Managing Actuary, ASA/FSA. Seeking someone with a healthcare background who will support and analyze activities related to the Direct Pay, Local Group and National Accounts Market Segment. This role will be responsible for rate analysis, trend setting, gross margin reporting, financial forecasting and product development support. The incumbent must have the ability to communicate and present detailed business and financial information in a clear and concise way to all levels of management. SAS and/or SQL experience is highly preferred. Southeast Region. Healthcare Economics Analyst. Seeking someone with a minimum of 1 year of medical claims data experience who will concentrate on medical expenses and determine the root cause of trends. SQL experience is highly preferred. Open to a Healthcare Actuary or Clinician. Southeast Region. Pet Health. Experienced and innovative healthcare FSA sought for a role focused on innovation and working with the existing Actuarial team to build out a modern healthcare analytics foundation working alongside Property & Casualty actuaries. Product line is growing quickly – this position will have great visibility and exposure to senior leadership. Southwest Region. Actuarial Associate, Pre ASA – ASA. Seeking someone with 1 - 5 years of Actuarial experience, preferably with health insuranceand/or reinsurance modeling experience. The focus of this position will be financial reporting. This is a rotational position. Southeast Region. Health Actuary, Pre-ASA. Seeking an actuary to use their knowledge to support the company’s financial and growth goals through data mining and analysis that supports pricing and risk assumptions. Updates actuarial pricing, reserving and forecasting models as directed. Southeast Region. A&H Actuary. The client is searching for an FSA to work on pricing, product development, and analysis for the voluntary benefits business. This is an excellent role for candidates interested in interacting with various other internal business functions in a result driven organization. Actuaries with four of more years of relevant Accident & Health experience and management potential are preferred. Multiple Locations. AVP, Corporate Analytics. The incumbent will provide leadership and oversight for the organization’s analytics, including but not limited to Clinical, Contracting, Network, Operational and Sales & Marketing. The ideal candidate will have managed a staff of Analytics related professionals and have experience with advanced statistical packages, modelling techniques and manipulating large data sets in modern tools. It is essential to have working knowledge in Python, R, Oracle, NoSQL, Mongo and/or Hadoop. The candidate will have a Master’s degree or a Ph.D. in a health related field or equivalent experience. Some travel. Eastern Region. LTC, Associate Actuary. ASA or FSA needed to report to the Director within the Pricing and Experience Analysis area. Will be responsible for various form analysis, rate increase filings, and management reporting on the LTC business. Potential to manage a small staff. Southern Region. Health Consulting, Pre-ASA / ASA. This position is responsible to conduct and review financial analyses for employer group health plans. Working on several projects at once and interacting effectively with colleagues on all levels. Manage projects' timelines for clients deliverables. Proficient use of Excel required; SQL a plus. Southeast Region. ASA or FSA, Health Consulting. Seeking an actuary with 5-10years of health experience who is open to business development and strong technique skills. Southeast Region. Actuary, Supplemental Health. ASA or FSA with pricing and/or product development experience with individual and group supplemental and voluntary benefit health products. May manage a small team of employees and lead the development of actuarial talent within the organization. Southwest or Midwest Region. AVP/VP, LTC Hybrid Pricing. Seeking an FSA with LTC experience to be responsible for the analysis and pricing of LTC hybrid products. Will also play a key role in developing assumptions, financial projection models and tracking actual results. Reinsurance pricing applications such as MOSES,TAS, AXIS or PTS are essential. Must possess excellent oral and written communication and presentation skills. Southeast Region. VP & Actuary - Health Valuation. FSA to lead a team which will be responsible for: Medicare Supplement, Medicare Advantage, Supplemental Heath Coverages (Cancer, CI, Hospital Indemnity, etc), Individual Disability, Individual and Group Long Term Care, Special Risks and Workplace Products (LTD, Life, etc). Will perform SAP, GAAP, and Tax valuation as well as reserve and asset adequacy analysis, valuation model ownership, best estimate and valuation assumption setting, as well as rating agency and SOA/AAA study support. Midwest Region. Healthcare Consulting, Individual Health and Small Group. Seeking an ASA with a minimum of 4+ years of consulting and/or health plan/insurance company experience. Must also have experience leading small to medium sized teams. Some work to include product design and/or product strategy, value based care/ACO modeling, risk adjustment, and some M&A work. Must possess proficiency with MS Office and be able to program using SQL. Must have a willingness to travel. Also open to a Career-ASA. Eastern and Midwest Regions. Risk Adjustment Manager. The client is searching for an experienced health insurance professional to serve as a leader in risk adjustment analytics and data oversight. This candidate will be relied upon to research, prepare, and present analysis in risk adjustment and revenue optimization strategies to key decision-makers within the organization. The ideal candidate will have 5+ years of related experience and strong technical skill in financial modeling, reporting, and data mining. Southeast Region. Consulting Actuary, Healthcare. Seeking an ASA or FSA to provide consulting services to a broad array of clients in the healthcare field with primary focus on Medicaid and Pharmaceutical consulting. The ASA level position will assist in project management and review. This position provides excellent opportunities for professional development and advancement. The FSA will be in a leadership role overseeing project and client management. This position provides excellent opportunities for professional development and advancement. Excel skills are required and SAS is highly preferred. Midwest Region. Director GAAP: FSA to direct and provide actuarial and technical support for development and management of GAAP valuation and financial reporting systems including monthly, quarterly and annual financial reporting. ArcVal a plus. Products include Life, Annuities and some Health products. Eastern and Southeast Regions. Actuarial Student Program, Healthcare. Seeking a student with at least 3 years of actuarial experience and a minimum of 2 exams. Duties to include working on the planning, design and implementation of Medicare projects. Experience with SAS, Excel, Access and/or PowerPoint are essential. Since this role is part of the student program there will be job rotations every 18-24 months and comprehensive support of the pursuit of the Fellowship in the Society of Actuaries. Northeast Region. Health Actuary, Manager & Senior Manager. Top firm seeks two actuaries, ASA or FSA to work with clients on health care reform, design leading edge medical and pharmacy products to attract healthy members to a health plan as well as price medical, pharmacy, dental, and vision benefits. Must be willing to travel. Excellent communication skills along with 6+ years of health actuarial experience required. Multiple Regions. ASA, Health Actuary. This position is responsible for a wide range of tasks to include enhancing and developing pricing models and related rate recommendations, analyzing and monitoring claims trends, completing claims triangles and reserve estimates, preparing restated financial statements and actuarial exhibits for financial reporting purposes, and updating financial forecast models and assumptions. 5 years experience as a health actuary preferred. Southern Region. Director & Actuary, Model Validation; FSA or ASA to lead the validation of certain critical models by reviewing model assumptions, data sources, mathematical formulas, processes, and business applications. Should have 3+ years of direct experience in building and improving models (in SAS, MATLAB, Polysystems, ALFA, AXIS, etc. ), and knowledge of Valuation, Projections, Experience and Pricing actuarial processes. Southeast Region. ASA, Health Actuary. Seeking an actuary who has technical expertise with ability to actively participate in multiple consulting projects simultaneously. Wide variety of assignments, including pricing, product design, merger & acquisition support, statutory and tax valuation and/or ORSA support. Product expertise needed in: Critical Illness, Accident and/or Hospital Indemnity with at least 4+ year’s experience. Southeast Region. 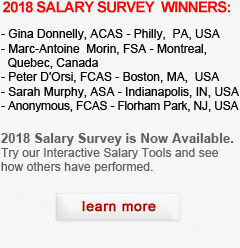 Salary competitive plus bonus. Entrepreneurial Health Actuary. Our client is changing how health insurance works by using a consumer-focused and tech-driven approach. Looking for a technical mid-level actuary ASA or FSA with an entrepreneurial spirit. Must have Healthcare experience. Eastern Region. Salary: Highly Competitive plus equity.